Feel free to skip this section. I tested on a target, Linnkotsu, in fb19 with a combination of lvl 10 Frenzy and the Dominance Blessing. My normal test dummy, Quilue, was unavailable. This was a duel using only punches which deal a fixed physical damage. with dominance blessing and frenzy. This exactly matches: (1 + (A - D)/100) and disproves =1.01^A * 0.99^D. After my initial results I was told that the formula doesnt hold for higher defense levels and collected data to test this. For this I used unarmed attacks against a psychic with varying defense levels. (1+(A-D)/100) matches exactly for positive values of (A-D) but not negative negative. Let's see the effect on the effective enemy HP with full 24 stone sharding in addition to +8 attendance blessings. If you have a ATT+32 advantage they are 24.2% easier to kill. If enemy has a DEF+24 advantage they are 28.8% harder to kill. If enemy has a DEF+48 advantage they are 57.6% harder to kill. If enemy has a DEF+56 advantage they are 67.2% harder to kill. 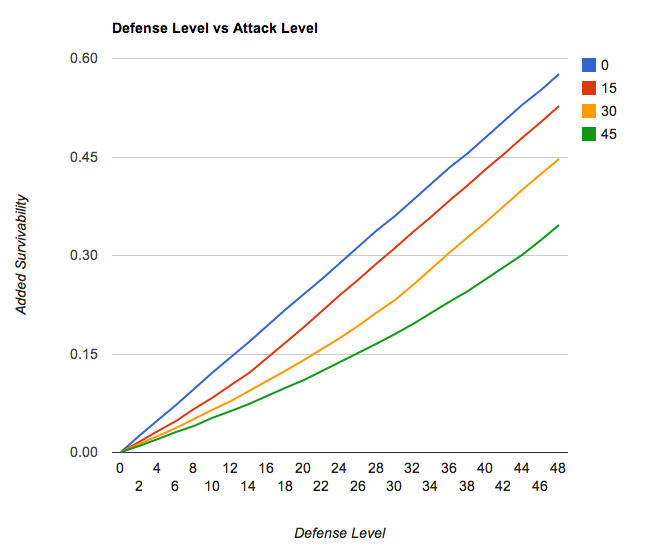 The blue line is for an attacker with attack level = 0 and corresponds to PVE pretty much. The red line (attack level = 15) is for someone wearing the anniversary blessing. The yellow (attack level for someone wearing Jones blessing. You can see that defense sharding actually becomes more effective after you get more defense level then their attack level. Attack level exactly cancels out defense level but attack level has diminishing returns while defense level has constant returns. The full sharding with DEF+1 stones isn't really more effective than Citrine gems or Vit stones for most classes unless they have high base HP. DEF+2 sharding is nice but when comparing them to Vit Gems keep in mind that Vit Gems add to both HP and defense.